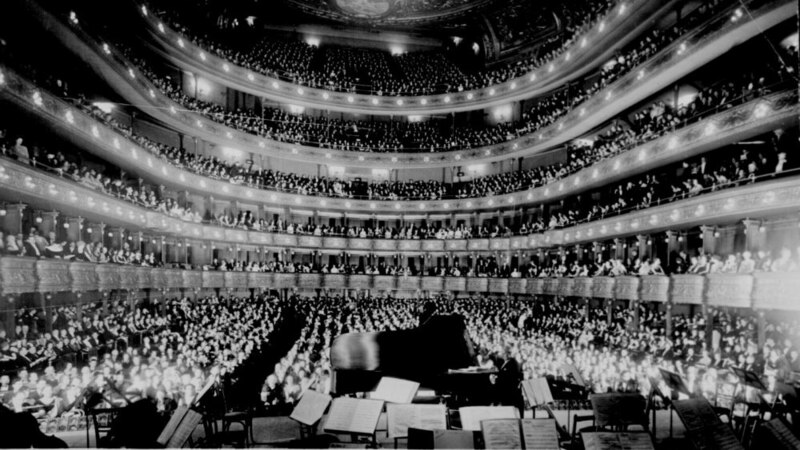 Opera At The Met: 80 Seasons On The Radio This past weekend, the Metropolitan Opera launched its 80th season of radio broadcasts, making them part of the longest-running classical-music program in the U.S.
Last year was momentous for the Metropolitan Opera's radio broadcasts. On Dec. 18, the broadcasts launched their 80th season, making them part of the longest-running classical-music program in the U.S. And 2010 also marked the centennial of the first time an opera was broadcast from the Met's stage. The marriage of opera and broadcasting began on Jan. 13, 1910, at the Metropolitan Opera. It was an experimental broadcast, a decade before the appearance of the first radio stations in the U.S. Mark Schubin is the Met's unofficial media historian. "The inventor who had arranged for the broadcast, Lee de Forest, had asked the radiotelegraph operators if they would kindly refrain from transmitting during the Jan. 12 experiment, and they did," Schubin says. "But on the 13th, the inventor of the equipment used to pick up the opera decided that he should invite the press. One of the radiotelegraph operators did not abide by the silence code, and there were crackles of static coming from his transmission of Morse code. One of the reporters asked what the Morse code said, and it was, 'I have just taken my beer and now I take my seat.' "
That first full opera, broadcast on Jan. 13, might well have been a mix of singing and static. "We all realize that opera has grown from a private luxury to a national necessity. And the responsibility must pass from a limited group to an unlimited group ..."
Belmont was the first woman on the board of directors of the Metropolitan Opera, and it was through these appeals that its finances were stabilized. But if there was one voice more than any other that ensured their success, it was that of Milton Cross. From his seat at the old Metropolitan Opera House at 40th and Broadway, Cross brought the drama and spectacle of grand opera to millions of radio listeners across the country. Cross hosted the broadcasts from their inception until he died in 1975. Ned Eckhardt lived in Greenwich Village during the 1960s and remembers walking into a barbershop on a Saturday afternoon in New York when the broadcast was playing. "There were about 75 people in the barbershop," Cross says. "Three barbers were singing the aria all together, and it was a great cacophony of wonderful sound. And when the aria was over, everybody cheered and went bravo. And the three barbers took bows." "One of the things I hear from people all the time is how long they've been listening to the broadcasts," says Margaret Juntwait, the current host of the Saturday broadcast. She's only the third person to hold that job after Milton Cross and Peter Allen. "One of the things that you hope to bring into a broadcast is a real sense of what we are all experiencing here at the Met," Juntwait says. "If you're sitting in your home, you want to be able to meet the broadcast halfway with your imagination. You want to be able to picture what things look like on the stage. That's something that I got from Peter Allen and Milton Cross, is creating an experience in the mind." While the Met plans to continue the radio broadcasts, it has also been simulcasting some performances in movie theaters across the country.